Sound is strange because, in isolation, it kind of doesn’t exist. Sound is a type of energy made from the movement of air particles. Particles vibrate when excited and bump into each other. It’s for this reason that sound doesn’t travel through space. There just aren’t enough particles to ‘excite’ each other. But even on Earth, if there’s nothing to hear the sound waves – no ear drum to register the waves as they enter our bodies — does it even exist? Actually, the answer is yes. Some of the loudest things on earth are not audible to the human ear. You didn’t hear it. But you bet other animals did. At a certain pitch, sound waves are so energetic they can cause damage and even death. Sound operates on what is called a logarithmic scale. A sound of 100db is 10 billion times more powerful than 0db. 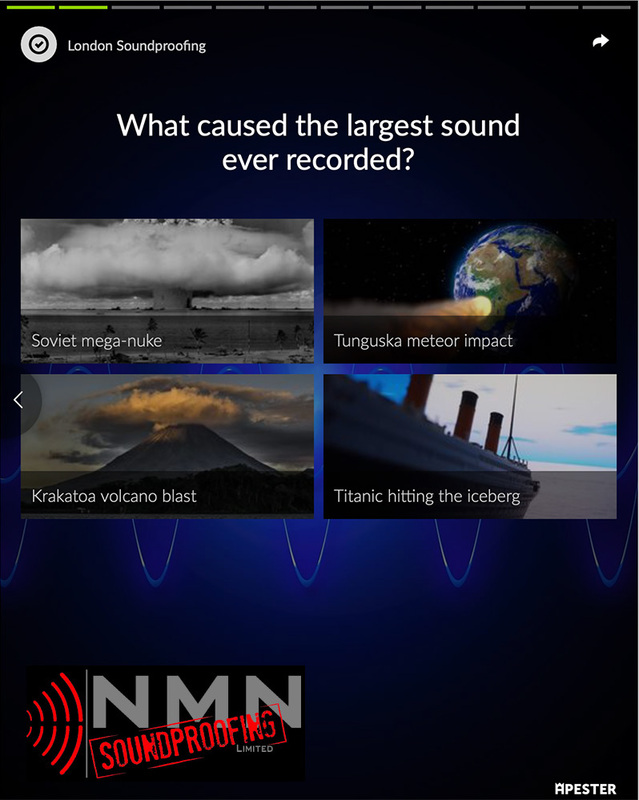 Some of the loudest events ever recorded on Earth (nuclear detonations; meteor impacts; volcanic eruptions) have weighed in at over 300db. Sound waves at such violently-high levels transform into shock waves. Shock waves have the capability to cause massive internal damage without (seemingly) causing any physical harm. The first time this really came to public attention was during the Second World War. After air raids, casualties with no wounds or any sorts of marks were reported. It took an autopsy on the unfortunate individuals to find that the internal organs were all mashed. That’s the power of a shock wave. Sound is not limited to simple vibrations that our auditory senses pick up. It can manifest in other, tangible ways, too. Sounds at certain frequencies can alter our minds and make us feel, think, and behave differently without us even knowing it. A tightening of the chest is one example of how sound can impact us in more ways than just the audible sense. Take the quiz below to find out other ways that sound can affect us in similar ways. And despite the general truthfulness to the sense that sound cannot travel across the vacuum of space (mentioned above), a growing field in astronomy is actually overcoming this. New detectors are looking to the stars and converting radio waves – natural radio waves emitted from the Universe – into audible sounds. (And, as it turns out the Universe sounds remarkably creepy. NASA has released a whole collection of eerie, lonely sounds from deep in outer space, available on the website.) Radio waves are at the low end of the spectrum of what’s called ‘electromagnetic radiation’. It’s not the scary type of radiation. In fact, your eyes are flooded with a part of this radiation all the time. We see it as ‘light’. Everything we can see, including the colours we perceive, is radiation. Using technology such as the LIGO (Laser Interferometer Gravitational-Wave Observatory) and others, scientists have even ‘heard’ the oscillations of a supermassive black hole. It ‘sings’ very slowly, but leaves the patterns of sound waves in the nearby gas clouds in the space around it. What do you know about sound? Of course, we’ve held back on the most interesting facts about sound because they are all here in this quiz (provided by London Soundproofing). So take the test and get back to us. How well did you do?